The disease cholera has persisted in Asia since time immemorial. 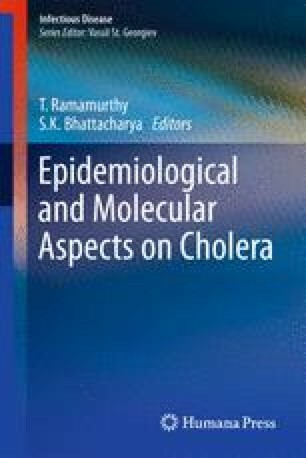 Almost all the pandemic phases of cholera had its origin from the Indian subcontinent. Historically, waves of cholera have wiped many million lives in this region mainly due to the general insanitary conditions and poor management of the disease. All the three cholera causing vibrios namely classical, El Tor, and the O139 have emerged from Asia at different times and one was replaced by the other by overcoming the acquired immunity. Antimicrobial resistance was not a big problem in the early 1960s as its use was very limited. With the use of third-generation drugs, Vibrio cholerae has acquired many resistance mechanisms over the passage of time and also due to prevailing antibiotic pressure. With its biotypes/serotypes there are considerable variations at the genetic level and many clones of V. cholerae have been detected. Recently, the hybrid strain of El Tor has spread in many Asian countries causing several cholera outbreaks. However, the importance of such genetic changes was not fully strengthened in epidemiological perspective. The perspectives of cholera vaccines have shown to be encouraging in many recent vaccine trials in Asia. Traditional medicine has lost its glory as it lacks the scientific evidence in curing infectious diseases. Some of the herbal formulations are now reconsidered for extensive research. The control measures for preventing cholera are yet to gain momentum in many Asian countries, as it involves coordination of government and the public with adequate funds to revamp the water supply and waste disposal systems. On the other hand, the clinical management of cholera and other diarrheal diseases are largely under the control in Asia.